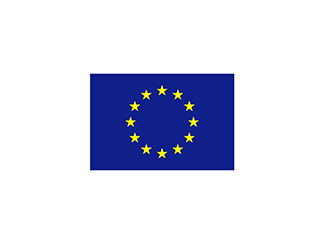 The EU is currently financing a Farmers Club project to promote Civil Society in the Cabinda Province of Angola. The country’s GDP has been growing for over 10% per year for over a decade, and has a steady income stream from petroleum, rubber, hardwood, and various minerals, yet over 50% of the population lives on less than $1.25 per day. Angola actually has excellent conditions for agriculture compared to most sub-Saharan nations, however up to 80% of food is imported, according to FAO. The Cabinda itself is a provincial exclave, meaning that it doesn’t share any of its borders with the rest of the country – it is bordered to the south and west by the DRC, and to the north by the Congo-Brazzaville. Home to 60% of the nation’s oil reserves, resource wise it is arguably the country’s richest province. However in terms of personal economy, it is one of the poorest. 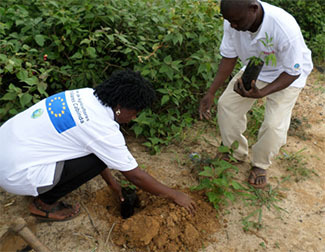 Now in its second year of operations, Farmers Club Cabinda model has organised farmers into cooperative-type groups where they learn improved agricultural techniques. The life of a subsistence farmer is often hand-to-mouth; all of their energy is put into feeding themselves and simply surviving. There is no time (let alone money) for things like education or community building, or trying to achieve a steady income. There is actually substantial government support for small-scale farmers in Angola, however to get access to that support, farmers need to know how to read, keep accounts, and also be confident enough to brave the perils of bureaucracy. The gap will take years to fill, but with EU support, Humana in-country partner ADPP-Angola is working hard to cover the basics first. There are currently 20 clubs of 50 farmers each. Each club has a demonstration plot, where they can practice and see the results of improved agricultural techniques before taking the step of applying them to their own plots. Club Committees are selected and trained to organise their clubs, and everyone works togethers to increase productivity. When the time comes, together they will have far more negotiation power as a group. Small Business training teaches them to take stock of what they grow and sell each year so that they can keep track of progress and setbacks. This year one club produced 10 buckets of tomatoes. 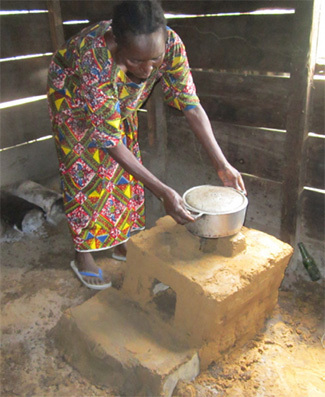 Women have been taught to make and sell firewood saving stoves, which when used, reduce forest degradation and free up a lot of time for women and children who traditionally spend hours each day gathering firewood. Once they have enough to eat and surplus to sell, they can think about sending their children to school, and learning to read and write themselves. Once a certain level of knowledge and skill is reached they will be able to register as official cooperatives. The program has also built relationships with local government bodies to guide them through the process. Creating an official cooperative will drastically improve their access to governmental services, such as credits and loans, as well as new markets. It’s a process that can transform a community, and written down like this, it seems quite straight forward and simple. But it takes years of focused hard work, countless set-backs and more determination many of us understand. So next time you see a photo of one of our success stories, take a second to think of what it took to achieve that. And be happy for the person in the photo and just how much they have overcome.